If you are addicted to speed, if you are car lovers and Joomla user... We got something hot for you! The Joomla Car template - Hot Cars is as beautiful and as fast as your toy on 4-wheels! Moreover, it can change the color theme in matters of second and use one of four predefined schemes. Also, you can set custom colors of your preference. 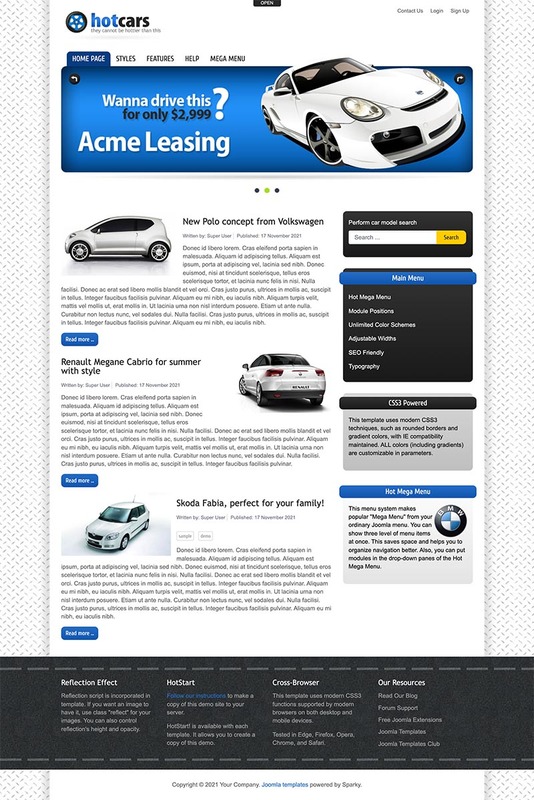 Many other tunings are available with this Joomla car template. No need to visit your car service! This template has been updated recently and the latest version based is fully responsive and mobile friendly. 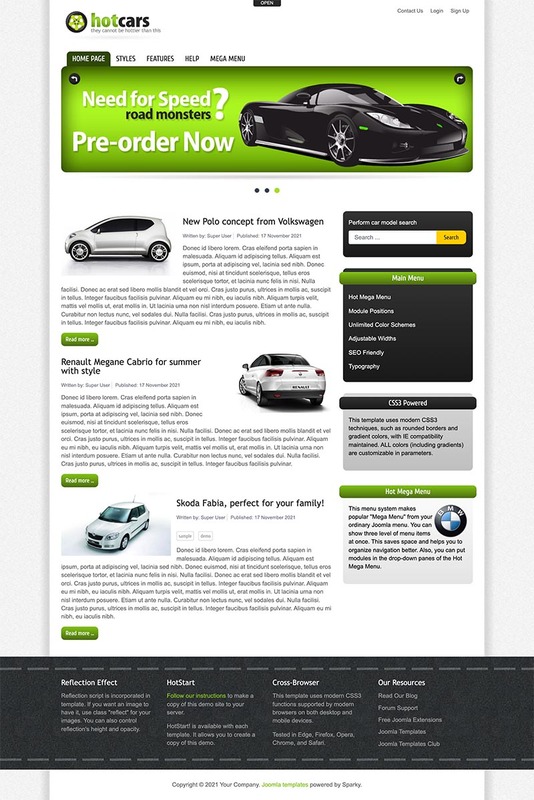 Joomla car template can be used for blogs about cars. It is also appropriate for car service shops or stores for car parts. You can use it to create website for car reseller or even car producer. It's possible because this template looks good on all screen sizes, including mobile devices. That being said, we can conclude that Joomla car template will be a good starting point for development of any Joomla site related to all types of vehicles. All modules, images and content pages that you can see on our demo site are included with this template. You will get the Hot Effects Rotator that's styled for use with Hot Cars template. It's a powerful tool that you can use to create eye-catching carousels for your website. 100% responsive template code. Valid HTML5 code. Four pre-defined styles. Colors are easily customizable in the parameters of Joomla car template. You can make infinite color combination. Responsive Hot Effects Rotator module (value $15) included in the template package. Dynamic drop-down menus: Hot Mega Menu and Classic Drop-down Menu. The menus converts to a button on mobile devices. 22 fully responsive module positions. Font Resizer, Reflection and Top Panel scripts included.